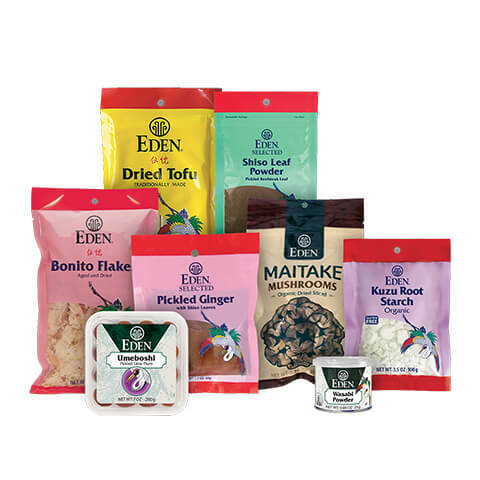 Since 1972 Eden has cultivated trade with artisans dedicated to traditional food making for our supply of miso, soy sauces, sea vegetables, and a variety of specialty food items. 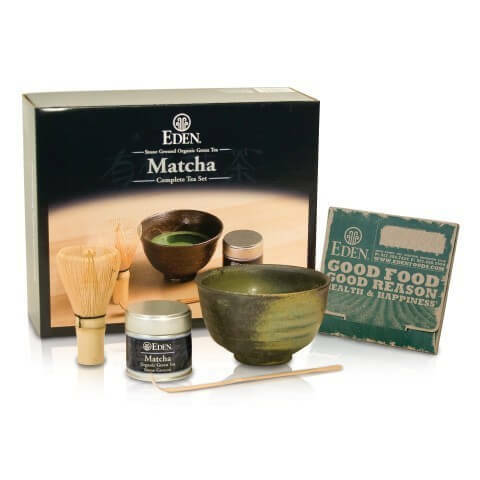 EDEN For a concentrated green tea experience we offer organic EDEN Matcha the finest ceremonial, stone-ground, green tea powder. It is dazzling, whether served warm or chilled. EDEN Matcha is far more than a beverage. Use it in desserts, confections, green tea ice cream, and more. 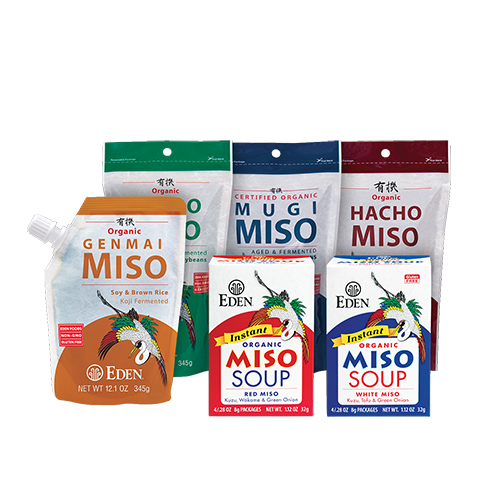 EDEN Organic Miso adds rich, appealing flavor to grain, bean, noodle, and vegetable soups. It is delicious in salad dressings, dips, sauces, marinades, and gravies. Miso soup is a satisfying way of regularly consuming two powerful health foods, miso and sea vegetables. Miso, fermented soybean paste, is rightfully earning appreciation outside of Japan as a delicious, exceptionally beneficial and protective probiotic superfood. It strengthens us, aids digestion, encourages appropriate intestinal flora, and fortifies our immune responses. Organic EDEN Mochi is stamina building food that is skillfully multi-step made of steamed, pounded, certified organic whole grain sweet brown rice. It is vacuum packed so refrigeration is not needed. Mochi softens and puffs when cooked. 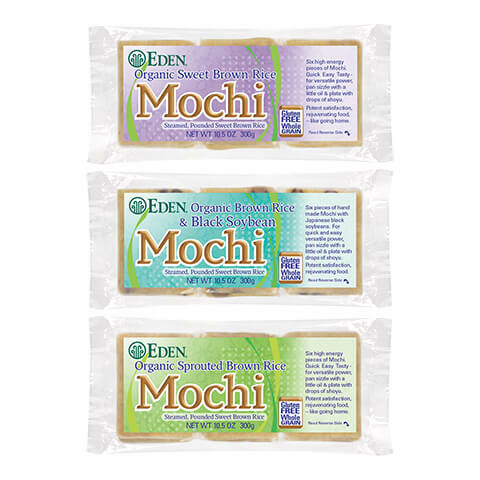 EDEN Mochi comes in three varieties: Sweet Brown Rice, Sprouted Brown Rice, and Brown Rice & Black Soybean Mochi. 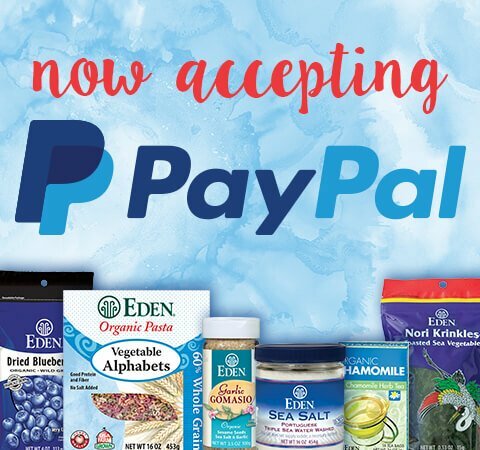 Quick cooking, versatile, and all are Gluten Free. 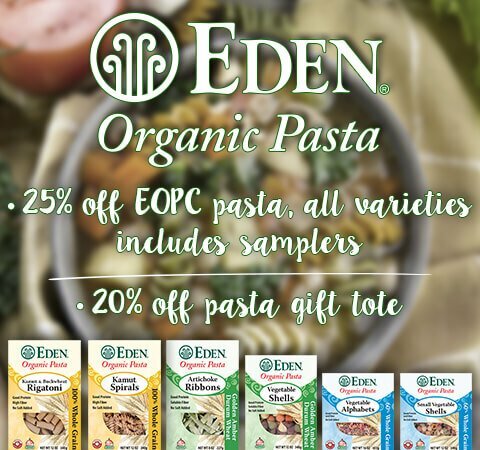 Use EDEN Mushrooms in place of beef or bouillon cubes in French Onion Soup or in place of chicken in rice, noodle, and vegetable soups. 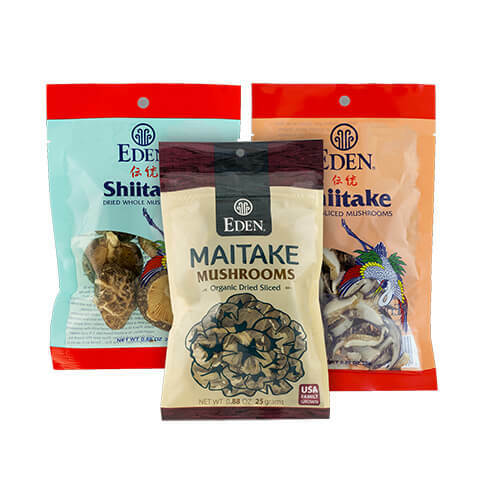 Dried mushrooms like EDEN Mushrooms are the only vegetable source of vitamin D. They contain the natural plant sterol ergosterol, a precursor of vitamin D2, much like beta-carotene is a vegetable precursor of vitamin A. 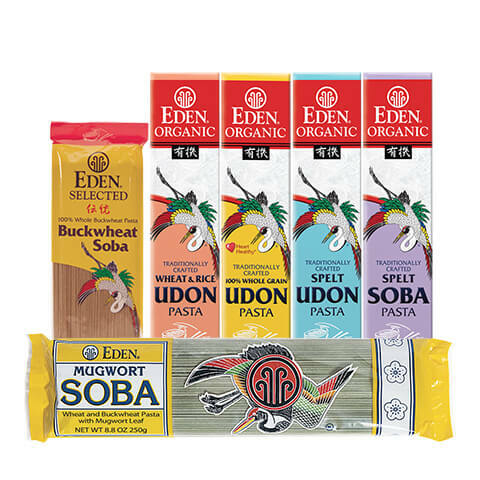 Seven varieties of organic EDEN soba and udon are made of the finest organic North American family farm grain. They are crafted in Japan for the Sobaya Company. Four additional EDEN sobas and two udons are imported from Japan. They are crafted by the Tanaka family who have been doing so since 1906. Like the Sobaya Comapany, the Tanakas use freshly milled grain, but a bit more sea salt. Another soba, EDEN 100% buckwheat soba is a bracing food handmade in Japan. 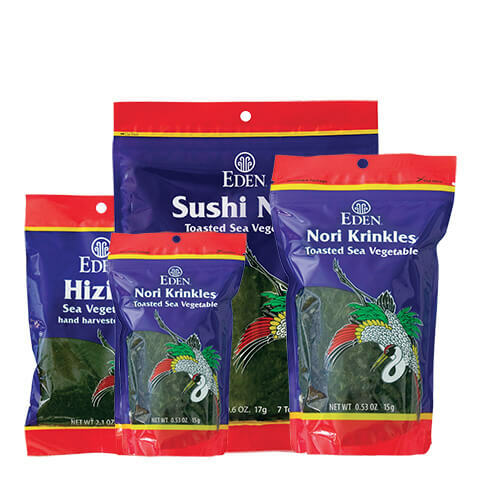 EDEN Sea Vegetables are world renown for their idyllic purity, superb flavor, and unique nutritional value. Fourteen varieties are wild or cultivated and hand harvested from environmentally protected areas. Each is prepared using solely, old artisan methods. 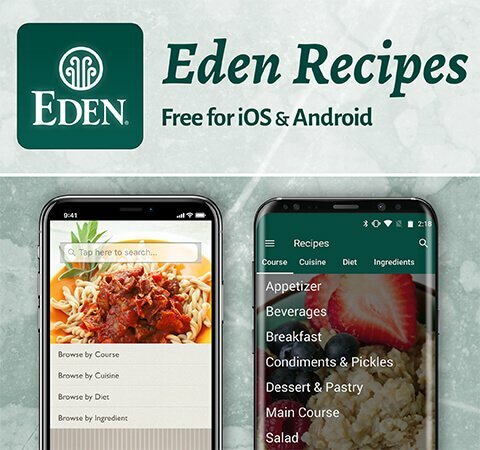 Eden believes that soy sauce should be chosen with care as one would choose a fine wine or extra virgin olive oil. Eden's traditional brewing of EDEN Shoyu and EDEN Tamari takes two to three years. Today, genuine soy sauce is rare. Most commercial soy sauces are made with refined sugar, refined salt, toxic caramel color, genetically engineered soy isolates, and pharmaceutically derived GMO enzymes and preservatives. 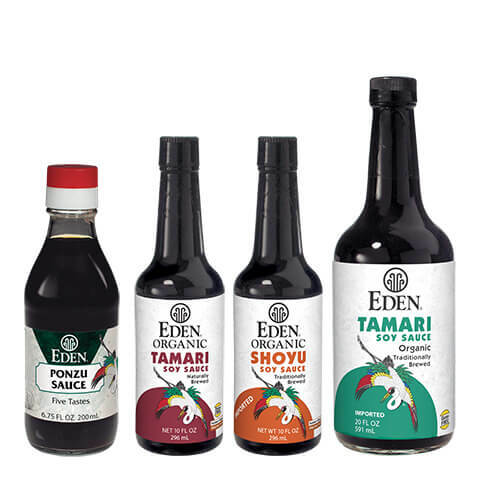 EDEN shoyu and tamari is skillfully, traditionally brewed from certified organic whole soybeans and are verified Non-GMO.